Copenhagen-based architects SLA have won the Nordic Built Cities Challenge Award for its innovative design for the City of Copenhagen, which will regenerate a central park and street while increasing the city’s resilience to flash flooding. The US$18 million Soul of Nørrebro project is being financed by the city and the greater Copenhagen water supply and wastewater utility Hofor. “This is the kind of solution that is really usable, and it’s also the kind of solution the rest of the world will be coming to Copenhagen to observe,” said Morten Kabell, Technical and Environmental Mayor of Copenhagen. The plans centre on the redesign of the city’s Hans Tavsens Park to attract a far more diverse population than it does at present. To do so, it plans to involve two local public schools in the planning and building of the park and to integrate the schools with the park itself. The project has been signed off by the city and the citizens’ involvement process has started. “It is exemplary how the project has included the local citizens to solve the challenge of cloudbursts. With the local input, which Team SLA has truly embraced in their proposal, we can create solutions that not only solve the current problems with cloudbursts but at the same time will be a huge cultural and social benefit for the entire community,” said Kabell. The design’s fundamental aim though, was to increase the city’s resilience to flash flooding after a torrential downpour in 2011 caused €1 billion in damages. The city’s response was the all-encompassing Climate Adaptation Plan and some 300 climate adaptation projects that came out of that. The inner city area of Nørrebro was one of the key areas highlighted for focus. 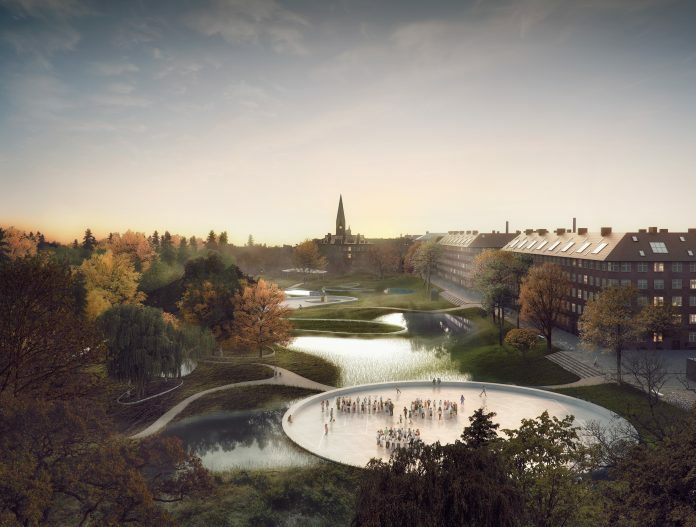 When the project is complete, Hans Tavsens Park will act as a natural rainwater catchment basin during cloudbursts for Inner Nørrebro capable of handling up to 18,000 cubic metres of water at one time. The excess rainwater will be led via the Korsgade street out into the Copenhagen Lakes. On the way, the water will be purified biologically by the specifically designed city nature biotopes that are established along Korsgade. The water will be a visible feature in the cityscape while contributing to irrigation and improving the local microclimate on the hot, sunny side of the Korsgade street, creating a series of new, blue-green public spaces.